Our lives are mostly perfect. Listening to a report in the car yesterday about a little girl who was badly burned by napalm in the Vietnam War, and has had pain (not to mention psychological trauma) every day, ever since, I decide that this was, in fact the case. It's been a long journey for her. She now resides in Canada, has found solace in religion, and has made peace with herself. In comparison, my travels, my trials, and my tribulations all seemed so insignificant. It became very clear to me that, for the most part, my life is good. It won't always be that way. There will be tragedies, sorrow, and pain, but while the seas are calm, why can't I just sit back and enjoy the ride? This is precisely what I tried to do while spending two hours attempting to navigate the streets of Paris yesterday - solo - by car. Well, I guess I wasn't entirely alone. I did have my 2-year-old toddler in the back, who had been in the car for hours, and hadn't had a change of diaper since we left Holland at 10 AM. But what's fantastic about getting lost in Paris, is if you survive the round-abouts and frighteningly bad drivers, you will at some point end up in front of incredible landmarks, completely by accident... such as Sacré Coeur, the Opera House, or the shockingly beautiful "Gare de l' Est" train station. So getting lost isn't, well, a total loss. After meeting a friend in the area known as the 19th District, checking into the hotel, and parking the car, we hopped on the metro and headed out to an area called "Le Marais" for dinner. 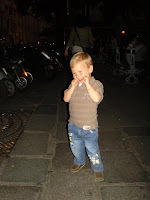 There we found a fantastic Italian Restaurant on a quaint little square, perfect for people watching (and letting the kids play) in the cool evening breeze. Dinner was good, as was the service, and we finished off the meal with an ice cream sundae before flagging down a cab for our return. After forking out a whopping €10 for the taxi ride home, we laughed about the trouble we had gone through earlier that evening, determined to save money by riding the metro. The moral of the story, if you can share a cab, by all means, do! The next morning I rose early for a brisk walk down the "Avenue Secretan", stopping at a Pâtisserie along the way for some fresh bread and goodies. Back at the hotel, I woke up my son and my friend, Jen, we had breakfast, and began the day with an outing to the incredible (and non-touristy) Buttes Chaumont park. There, we bumped into a friend of Jen's, American-born Julie Wayne, author of The Kalipatti Qaurtet, who was practicing Tai-Chi (complete with sword, which Lukas found very cool). I absolutely adore finding little corners of the world like Buttes Chaumont - places with history and loads of character, where the locals go to relax and unwind - and am so pleased that we took the time to meander through its paths and gardens. Had we had just a bit more time, we would have made an effort to get to the other side, visiting the park's real treasure: the Promontory (pictured left). We saw it from the car, but couldn't manage to find it on foot. Maybe next time. The trip back to Holland went by very quickly, for which I was grateful. Now back in The Netherlands, I'm determined to enjoy my uncomplicated, good life here on the farm... while it lasts.